One of the more popular--and controversial--recreational uses of the desert is riding motorcycles, all-terrain vehicles, dune buggies, and four-wheel-drive cars and trucks. Such off-highway vehicles (OHVs) can seriously damage fragile desert ecosystems. Compacted soils severely inhibit the growth of plant roots. They also keep water from seeping into the ground, increasing water runoff and altering the water-holding capacity of the soil. This is particularly significant because disturbed desert soils can take thousands of years to be restored given the desert's limited supply of biodegradable materials (or biomass), intense solar exposure, and low moisture. Vehicles can also cause direct damage by running over and destroying plants and even animals such as lizards and tortoises, or crushing the underground burrows where tortoises often spend much of the day. As a result, OHV use is managed by federal agencies to keep vehicles away from the most fragile areas, while allowing OHV activities on more durable surfaces, such as barren sand dunes or clay flats. In most cases OHV use is confined to designated roads and trails; some areas are fenced to keep vehicles out of sensitive habitat. Other areas, such as the Desert Tortoise Research Natural Area near Ridgecrest, California, and designated wilderness areas within the Mojave, are closed to OHV use altogether. In many areas of the Mojave the BLM has implemented OHV policies that require active management of sensitive areas. Balanced management helps prevent OHVs from stirring up and loosening thin desert topsoil layers--which accelerates erosion--or destroying microbiotic crusts, thin soil surface layers bound together by living microorganisms, including lichens and algae. At the same time, management of OHV access avoids soil compaction and the creation of hardened "roadways." Extensive military exercises that entail the movement of heavy equipment also can have serious impacts on desert soils similar to, but much more intensive than, those caused by OHVs. The U.S. Army, Air Force, Marine Corps, and Navy all operate major training or testing facilities in the Mojave Desert. The Department of Defense is working with the Department of the Interior to reduce the impact of its activities. 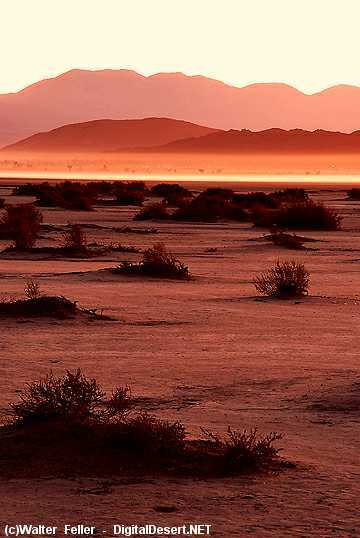 Because the Mojave Desert is sandwiched between high-tech, urban areas, there is an increasing need to connect these areas with new fiber-optic telecommunications lines and other utility services. Often these utility rights-of-way bisect wildlife habitat, causing weeds to spread and reducing species diversity. Land managers are working with utility companies to reduce these impacts by establishing right-of-way corridors along already established routes and by limiting new routes.